Insert a car tape adapter to play MP3s, CDs, and more on an old car radio. Cassette tape adapters are clever little devices that are shaped like compact cassettes on the outside, but the internal workings are quite different. While compact cassettes hold two connected spools of magnetic tape, on which audio or data can be recorded and stored, car cassette adapters contain magnetic inductors and a series of gears that allow them to fool tape decks into thinking that they’re the real deal. These adapters can be used to extend the functionality of any tape deck head unit to play CDs, MP3s, or audio material from virtually any other source. How to You Use a Car Cassette Tape Adapter? Listening to music in your car with a tape adapter is extremely easy, but there are a handful of snags that you might run into. 1. Insert the cassette tape adapter plug into the line out jack on your device. If your device doesn't have a line out jack, you can plug into the headphone jack. 2. Turn on your car radio and adjust it to the lowest level. 3. Insert the tape adapter into your car radio tape deck. If the radio doesn't automatically switch to the tape deck input, you may need to do so manually. This process is the same one you would use if you were listening to an actual tape. 4. Turn on your phone or portable music player and play a song, podcast, CD, or whatever else you are trying to listen to. 5. Adjust the volume of your car radio to the preferred level. If you are plugged into the headphone jack of your portable music device, and you don't hear anything, you may need to also adjust the volume on the portable music device. 6. When you are done listening, eject the adapter in the same manner you would use to eject a regular cassette. You can also just leave the adapter in if you prefer. If your tape deck has an auto reverse function, and you experience poor sound quality, pressing the reverse button may fix the problem. If your tape deck repeatedly reverses the direction of play, there is likely an internal fault in your adapter. Dispensing with Tape: How Do Cassette Adapters Work? Compact cassettes use magnetic tape as a storage medium. A component known as a recording head can be used to write, and rewrite, data to the tape, and a component known as a reading head is used by a tape deck to translate that data back into music or other audio content. Cassette tape adapters tap into the reading head in your tape deck, but they do it without any magnetic tape. Instead of spooled tape, each cassette tape adapter has a built-in inductor and some type of audio input plug or jack. When the audio input is hooked up to a CD player, or another audio source, it carries a signal to the inductor inside the cassette tape adapter. The inductor, which functions much like a recording head, then generates a magnetic field that corresponds to the signal from the CD player or other audio device. The reading head inside the the tape deck can't tell the difference between the magnetic field generated by an inductor and the magnetic field of the tape inside a real cassette. So it reads the magnetic field from the inductor, just as if it was coming from magnetic tape, and allows the head unit to reproduce the audio signal just as if it were actually playing a tape. Why Doesn't the Tape Deck Try to Reverse? Tape decks, and cassette tapes, are built with a feature that allows a tape deck to either stop playback or reverse playback when the end of a tape has been reached. If you have ever listened to music on a cassette tape, you're probably familiar with the loud clunk that happens when you get to the end, followed by the tape deck reversing and playing the other side of the tape if it has that feature. 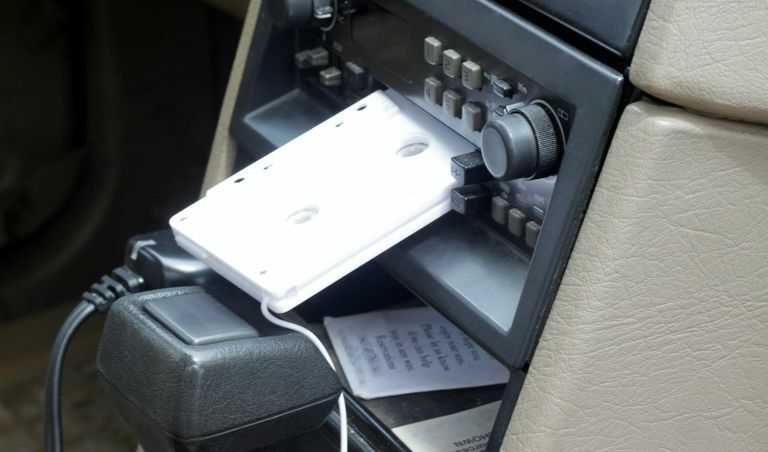 Since cassette tape adapters don’t have any tape, they need to include a mechanism to effectively trick a head unit into never stopping or reversing. Without this mechanism, the tape deck may not work at all or go into an infinite loop of constantly reversing the direction of play. To get around this, good tape adapters include a clever little device made out of a series of gears and some type of wheel component. This device effectively simulates a continuously running tape. If you have a cassette tape adapter that doesn't work because the tape deck refuses to play it, especially if it repeatedly tries to reverse the direction of play, the gear mechanism is probably broken. Tape decks aren’t as common as they once were, and car cassette adapters can be correspondingly difficult to find. They are still widely available, but there are a number of viable alternatives if you can't get your hands on one. FM transmitter - A nearly universal option that works with any FM car radio. Less useful if you live in an area where there are no empty spaces on the FM band, since too much interference results in poor audio quality. FM modulators - Similar to FM transmitters, these devices need to be permanently installed. They still require some empty space on the FM band, but they usually provide better audio quality than FM transmitters. Auxiliary inputs - The easiest option to use, but not all car radios include them. If your car has an auxiliary input, you can just plug your CD player, MP3 player, or phone directly into it. Head unit USB inputs - USB inputs are even better than auxiliary inputs in terms of audio quality, but if your head unit has a USB input it's probably too new to have a cassette tape player anyway. All of these methods are just as viable even if your car does have a cassette deck, and some of them even provide higher sound quality than you can typically expect from a car tape adapter.